All users identified for SIT UAT testing will be assigned the Tester role with the exception of the test facilitators who will have Full Access roles. Accounts for each tester are already created. Username and password will be provided prior to testing. 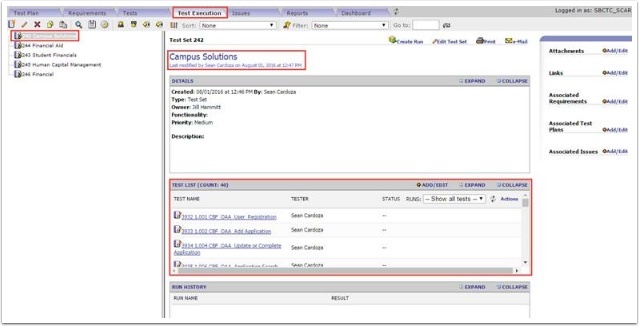 Testers will log into Oracle Test Manager at https://oats.ctclink.sbctc.edu:8089/otm/ (Tester accounts are already created prior to the test phase and usernames and passwords will be provided to each tester). Enter your Username and Password then click Login. 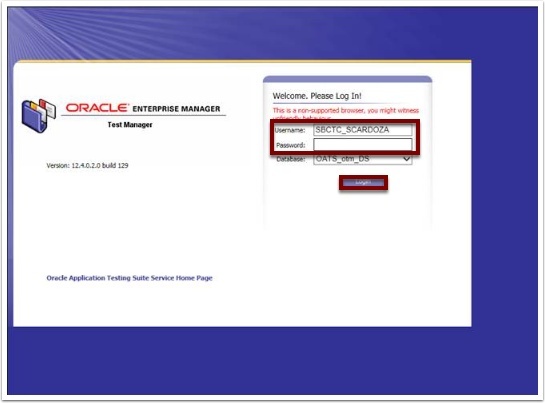 When testers log into Oracle Test Manager, they will have full read/write/execute access to the Tests, Test Executions, and Issues tabs. The Test tab will contain all test scripts in the left side tree view. Tests scripts may be assigned to a specific user. Use the Filter feature to query all test scripts assigned to a specific tester or for all test scripts identified for a particular test scenario. A Filter Tests box is displayed. Select the Field drop down menu and select the Tester option. Keep the default Operator value and select your user name from the Value list. 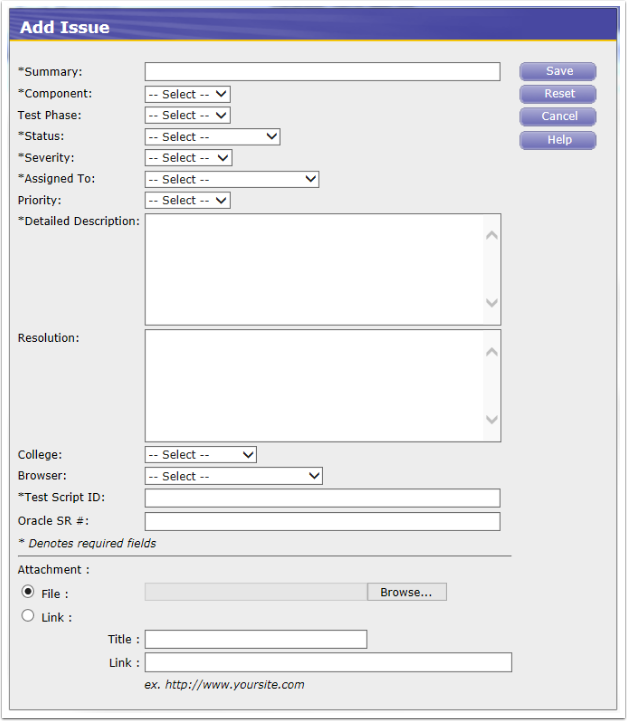 Select Linked Test Scenario # option in the Field drop down menu. 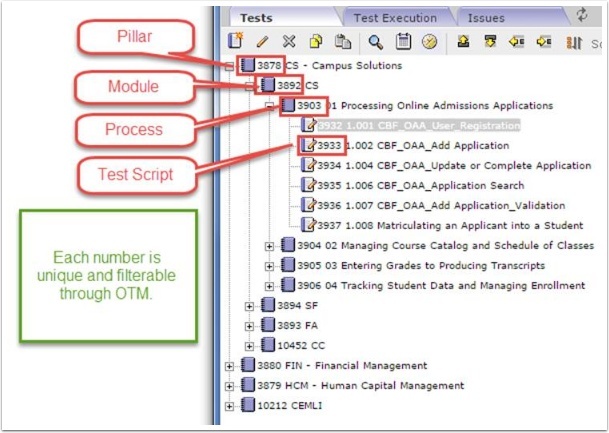 Enter CS, FIN, HCM, CEMLI in the Value field to return all test scripts for that pillar. Individual or group test scripts can be filtered by knowing the unique system generated test case id for the test script you looking for. Click on Apply and the test cases for the selected user are now available in the left tree view. Once you have used filtering and would like return to your normal view, click on the Filter dropdown list to the right of the Filter button. Click on None and the filter is removed and the normal view with all test scripts is returned. 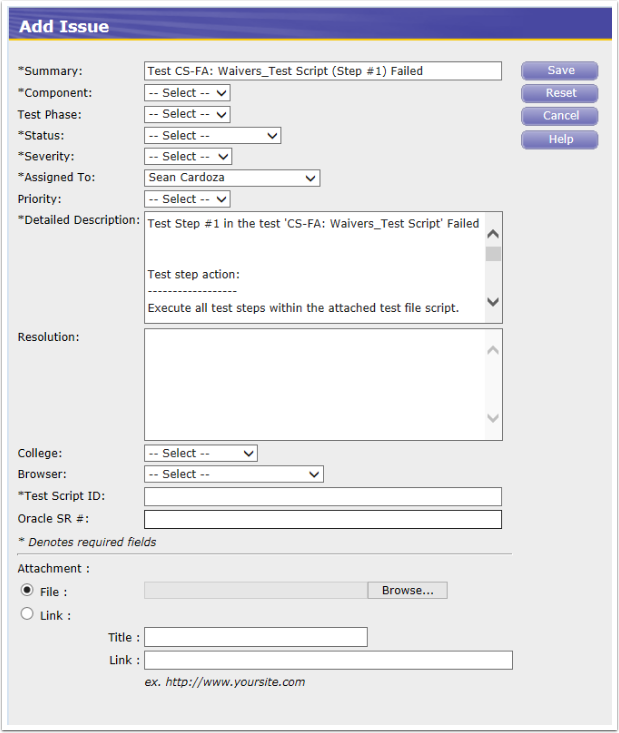 Select a test script to run from the left tree view. It will now be highlighted and the information for it displayed to the right of the tree view. Click on the attached file link listed under Attachments. Follow any prompts to download and open the test script file. A Test Run Info dialogue prompt is returned. Fill in the information as described below. Version: If not present, select SIT from menu options. College: Select the appropriate college from the list. A Run Manual Test window is returned. At this point, go to the test script file opened at the beginning of this section and execute all the steps. ⃰ See section 6.2 6.3 for processing passed and failed test scripts. Select a pillar from the left tree view. It will now be highlighted and the information for it displayed to the right of the tree view. Test scripts for each pillar are already present and displayed in the Test List area. Click on the test script hyperlink name to begin testing it. Click on the attached file link listed under Attachments. Follow any prompts to download and open the test script file. Run Name: Leave the default value. When the test script is completed and has passed expected results, follow the directions entered in step 1 of each test script. Execute all test steps within the attached test file script. PASS: If all the test steps meet their expected results the test script passes. FAIL: If one or more steps fail their expected results the test script fails. PASSED TEST SCRIPT: Select Pass in the Result list, go to the bottom of the screen and click on Complete Test Run. FAILED TEST SCRIPT: Select Failed in the Result list then click on the Add icon under Add Issue. Defects discovered during the formal test execution process will be entered using this process. If the test script failed, the tester is instructed to click on the Add icon under the Add Issue column header. This will open a new Add Issue window where users will enter required information for defects found while executing test scripts. All fields with an asterisk in the label name are required fields. (See Appendix A, B, and C for data element values and format). Defects entered as part of the test process will have some information in their Summary and Detailed Description fields already. Summary field: Leave the default value and add the Test Script ID to the beginning. After adding the Test Script ID it will look very similar to: 3857 Test CS-FA: Waivers_Test Script (Step #1) Failed. Detailed Description field: Click within this field and use the key command of Ctrl+A to select all. Enter the step number that failed and provide any additional steps or information that will help others to reproduce the same failed result. Once all fields are entered and the failed test script file is attached, click Save. Defects discovered outside of the formal test execution process will be added as new issues in OTM. Add a new defect, not associated to a test script/scenario by clicking on the Issues tab. A new Add Issue window is returned. Enter all required information and test steps in the Detailed Description field to allow others to reproduce the failed results. See Appendix A, B, and C for required values and format for each data element. Summary (defect found during SIT test script execution) User input required. Enter brief description of issue. High level description of issue. Detailed Description User input Brief description of issue and steps to reproduce it. Resolution User input Description of what was done to correct issue and steps to reproduce if different from Detailed Descriptions. Test Script ID System generated ID Each scenario and test script is assigned a system generated number which precedes the scenario/script name. The number is currently only four (4) digits long. See Appendix B for reference.